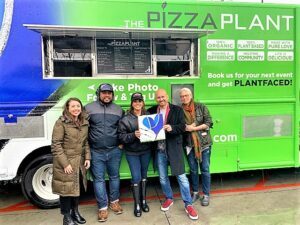 Pizza Plant has a Vegan Pizza Truck! A very special #LunchBreakLIVE with the Pizza Plant, a vegan food truck/restaurant that donates one pizza for every pizza sold to those in need! PizzaPlant.com is a compassionate company run by Marvin V Acuna, a film and television producer who has worked with some of Hollywood’s biggest stars! Compassionate capitalism at its finest! The Pizza Plant company regularly donates pizzas to the wonderful Union Station Homeless Services, coordinating with staffer Stephanie Harris. The pepperoni is made in house. Jane hops on the truck and watches the whole pizza-making process. They make their own cashew-based cheese, soy pepperoni, and crust. Rain or shine our JaneUnchained taste testers are ready to take a bite! Patrizia describes the pizza as “sooooo good,” and Paige says it’s “mmm mmm good.” Paige describes the crust as crunchy yet light and airy. 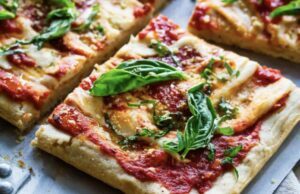 This pizza is a must-try, and now that they have a food truck you can wait for them to be in your area! This truck is going all over the Los Angeles area from Highland Park Block Party, Vegan Street Fair Sundays in North Hollywood, to Venice! 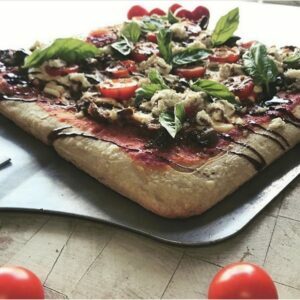 This pizza is so good, Pizza Plant has been nominated for the Vegout Awards! 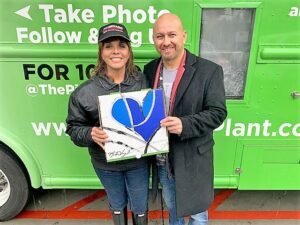 Jane and Marvin pose with the amazing original street art painted on the side of the Pizza Plant Truck! 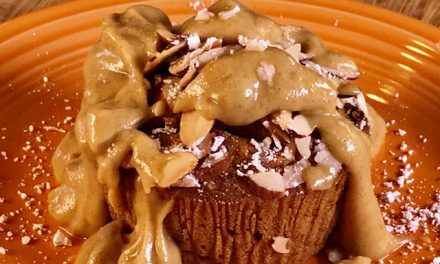 Marvin came from a career making Hollywood movies to the vegan scene because he wanted to contribute to the well-being of other people. He had a friend suffering with severe heart and lung problems. Marvin fed his friend a plant-based food diet daily and her health improved so much so she was taken off the transplant list. 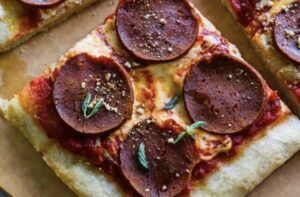 His parents inspired his idea to have a charitable plant-based pizza restaurant because pizza was such an integral part of his childhood. 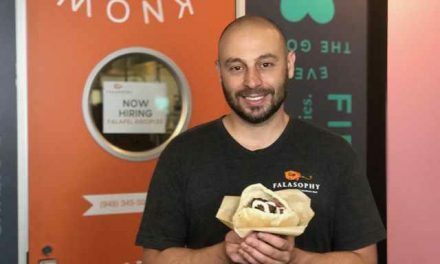 His parents also taught him to share abundance with others, so he decided to feed the homeless as part of his business operation. The residents and workers at the Union Station Homeless Services came out to show their gratitude for all of the delicious donations made by pizza plant. They also wanted to tell everyone how amazing this pizza is! 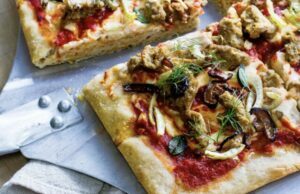 Who knew can eat mouthwatering vegan pizza and help people at the same time. Please support this amazing business the next time you are in the Pasadena area or find the location of their food truck on their Instagram! Rain or shine this pizza is divine! Follow The Pizza Plant on Instagram to find out where the truck is! Visit the Pizza Plant website! 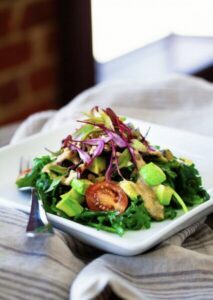 Vote for Pizza Plant on the Vegout Awards website! Visit the Union Station Homeless Services website! The not at all plain, cheese pizza! This sage and fennel pizza is a work of art. They have lighter options available too! Taste testers: Media Content Producer Patrizia Mari Barretto, Tish Strickland of Vegans of Pasadena, California, JNN Contributor/Producer Paige Parsons Roache. Photos courtesy of Jane Velez-Mitchell ,Paige Parsons Roache, and the Pizza Plant website. PreviousHighland Block Party is Poppin’! 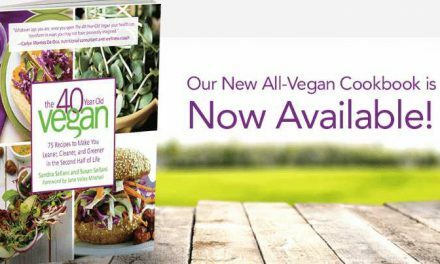 NextThe Veggielitas Make Vegan Meatballs! 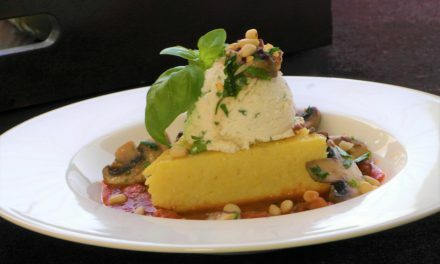 Tuscan Roasted Almond Cake…And Yes…It’s VEGAN!